Fulley Wood, nr Tichborne, Hampshire. Reported 24th June. 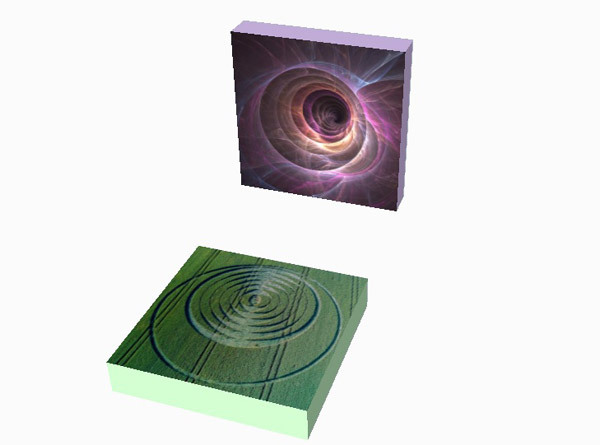 The formation can be explained in two different ways, one that refers to the galactic centre and one that refers to both the galactic centre as well as the connection of humanity to the stars and the galaxy in general. There is no doubt that this is what the formation expresses. In the centre of the galaxy, there is a bright and very compact astronomical radio source and this is also believed to be the location of a supermassive black hole: Sagittarius A*. Thus, the formation refers to Sagittarius A* in the galactic centre. Interestingly, an earlier nearby crop circle formation (June 21, Chilcomb Down) was also a reference to the stars and the galactic centre (see comments formation Chilcomb Down) amongst others! The formation refers to the stars. Hence, in principle, I count with precise 6.5 sidereal months (relating to the zodiac), but this only differs 0.4 days from 6 lunar months (relating to the lunar phases). When counting 6.5 sidereal months from the formation�s creation date, this refers to December 18, 2016. These 6 lunar months bring us, so to say, to the centre of the formation. This corresponds with the source of the radio wave, Sagittarius A*, according to the alternative explanation. This fact is very illuminating, as on December 18, the sun is in an exact conjunction with Sagittarius A* and the true centre of our galaxy (this is not the case on December 21 as many people believe)! It is likely this is an important step in the birth of the new world in the sense that it will create the opportunity to realign self-consciousness (the symbolism of the sun) with the centre of the galaxy. This is the mother womb of the galaxy and the gateway to the galaxy (�Hunab Ku�) beyond our sun. It refers to the consciousness of the creation of life that goes beyond our sun and our self-consciousness. The next step is to count another 6.5 sidereal months (about 6 lunar months) in future and this refers to the night of June 14 to 15, 2017. During this night, Saturn will exactly oppose the sun, while Saturn is in conjunction with the galactic centre. This means that at midnight Saturn is in the South close to the galactic centre. As during that night, the moon is in a conjunction with the northern node, also the earlier mentioned connection with the draconic month pops up. The time span of December 18, 2016 to June 14-15, 2017 probably relates to the opening of the gateway to the centre of our galaxy. See further comments formation Chilcomb Down for the explanation of the formation that also refers to June 15, 2017 and also refers to our (re)alignment with the stars and the galactic centre! "Radio source" is also a good guess IMO. I have bookmarked this video and convinced myself that this is an intelligent man. According to the Mayan calendar Tzolkin, 24th June 2016 is a day with the Solar Seal �Blue Hand� and with Tone 5. This is the 5th day of the Blue Night Wavespell. According to the Mayan 13-Moon calendar, 24th June 2016 is a day of the 12th Lunar month or 12th Crystal Moon with Tone 12 � the Crystal Tone of Cooperation. On the periphery of the formation is depicted a big lunar crescent �M�. It encompasses a circle, where are depicted 12 smaller lunar crescents. Here the number 12 symbolizes Tone 12 � the Tone of the actual Lunar month. The complex of the big lunar crescent together with the 12 smaller lunar crescents symbolizes the actual 12th Lunar month or 12th Moon. In my opinion, each of these smaller lunar crescents depicts symbolically stretched human arms. This depiction of human arms through a lunar crescent is used in many crop circles. On this way here is depicted the energy �Blue Hand� � the Solar Seal of the day. There are 12 smaller lunar crescents in total. Here the number 12 symbolizes also the energy �Yellow Human� (Solar Sela No. 12) � the Supporting energy of the Blue Hand. We can say, that these 12 lunar crescents depict humans, who are stretching arms to each other. We can also say, that on this way symbolically is depicted the Humanity. And the circle, on which these 12 lunar crescents are placed, symbolizes the Earth. On this way is depicted the energy Red Earth � the Balancing energy of the Blue Hand. The two smallest lunar crescents in the very center form an �Eye�. On this way is depicted the energy �Blue Eagle�- the energy of VISION, of Visualization. In the �Eye� we see 3 sheaves. Here the number 3 symbolizes the energy �Blue Night� (Solar Seal No. 3) � the major energy of the actual Blue Night Wavespell. The authors of the crop circle remind us, that we can use the energy of the Blue Eagle and to VISUALIZE all that, which we DREAM of. We can co-create the desired reality by visualizing it. And in the Blue Night Wavespell we can �inform� the Universe about our DREAMS. The Universe is like a Mirror, which reflects back to us all what we send to it. The Universe helps us to materialize our Dreams and Visualizations. 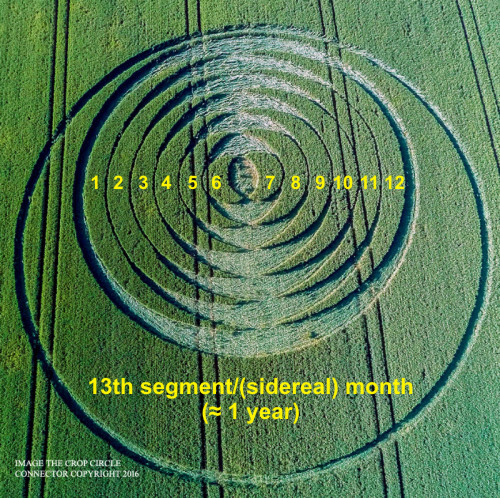 The authors of this crop circle remind us, that during the 12th Moon we receive Tone 12 � the Crystal Tone of Cooperation, which helps us to learn to cooperate with the other people. On this way we can together achieve the desired reality. the People on the Earth with stretched Arms to each other, live in Cooperation and create together the desired reality by Visualizing their Dreams!! Gratitude to the photographers and to the authors of this amazing crop circle!! The shock wave (or sound wave) created by the comet impact off of the crop circle center will be felt or heard thousands of miles from the point of impact. Since the crop circle indicates a daytime impact this could be the major fragment of the Warning Comet.